Choose a reasonable number of titles, enabling me to draw a fairly robust conclusions. For this purpose, I thought it best to look at some very well-selling books that have been out for a fairly long period of time, so that seasonal trends wouldn’t be confounded by “initial publishing” effects (i.e. the first few months after a book comes out, when sales are generally high). 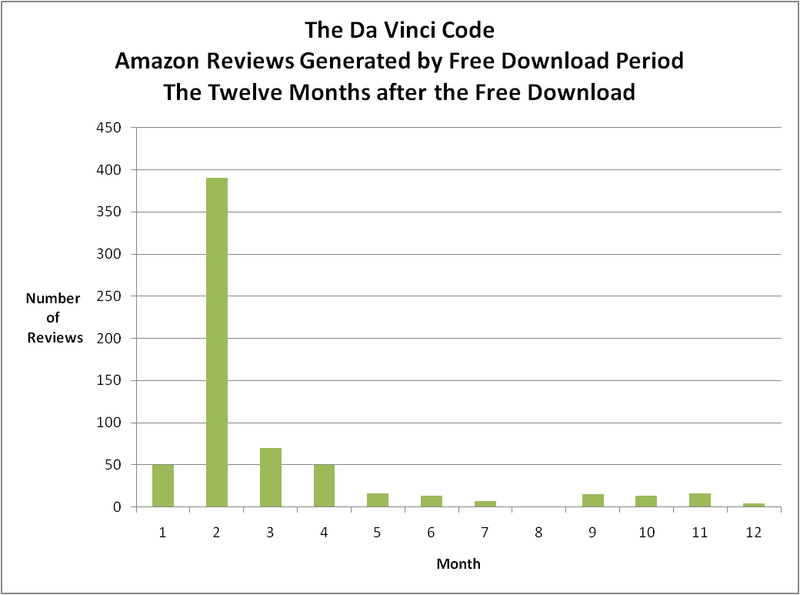 Record how many reviews those books had, by month and year, over the last 3 or 4 years, since the Kindle became a significant force in reading. Analyse the data, looking for seasonality trends - e.g. how big is the Christmas buying effect, do people really read more in the winter than the summer, are some books “summer reading”, do some books follow the school calendar? I am still collecting data for this study (a very tedious process), so it is too early to report anything substantial. As expected, there do seem to be some seasonal effects, but some books seem to show these effects more than others. One of the books that I elected to study was The Da Vinci Code, by Dan Brown. It showed a huge spike in reviews, in 2013, as you can see in the accompanying graph. 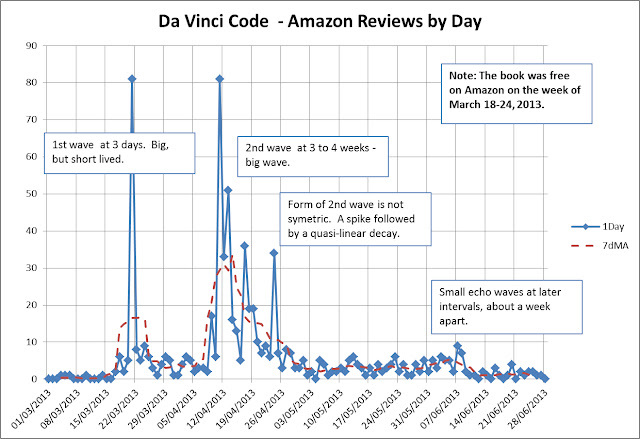 Naturally, this made me curious, so I zeroed in on the reviews for that book in a more detailed fashion, day by day, around the time of the spike. That yielded the graph below. The free download period was March 18-24, 2013. 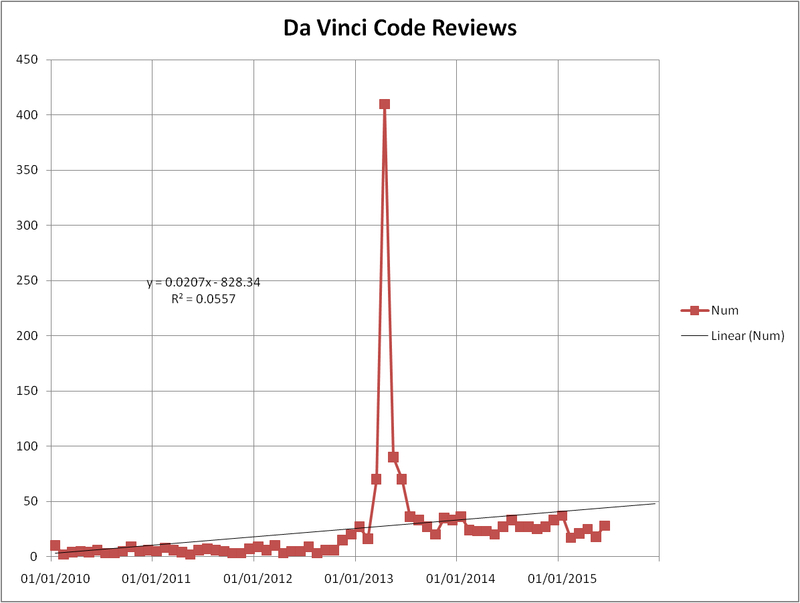 The first big spike in reviews happened that week, so clearly there was a proportion of the down-loaders who read the book immediately, then reviewed it. A couple of small spikes followed, in weekly intervals. This may reflect that people have more time to read and/or post reviews on weekends. Then, there was a big spike at approximately the third week. Smaller, but still significant spikes happened in the fourth and fifth weeks. Things trailed off after that, but small weekly spikes could still be seen for some time, three or four months at least. 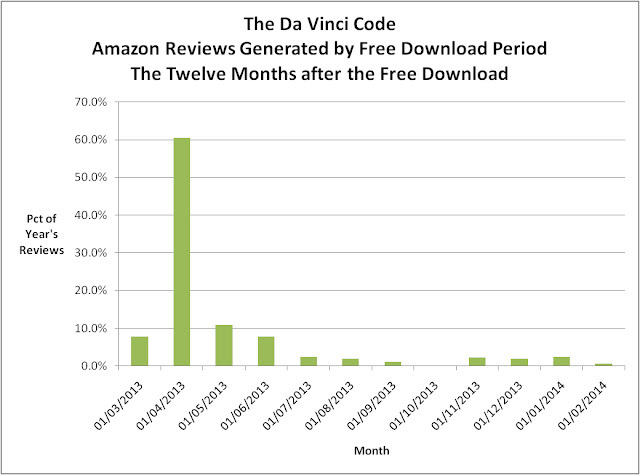 As you can see, the majority of the reviews generated from the download period came within the first few months, mostly within the first month or so. The actual percentages are shown in the next graph. So, this evidence supports the idea that most people (about three quarters) read an Amazon Kindle ebook within a month of obtaining it, or at least it does for this very particular book. The remainder probably read the book within a year. Some, of course, may never read it. Of additional interest, is the fact that in the post 2013 period, the number of reviews has averaged about 26 per month, compared to 20 per month before the download period. So, we might conclude from this that the freebie lifted the baseline reviews by this number, which would correspond to about 1000 books per month, assuming that about one person in 175 reviews a book. Of course we have to be careful about generalizing from this one case to Amazon books in general. People may have been quite eager to quickly read and review this one, given its notoriety. Conversely, that very notoriety may have turned a lot of people off, resulting in a high proportion of “never-reads”. Some things, only heaven and Amazon know. 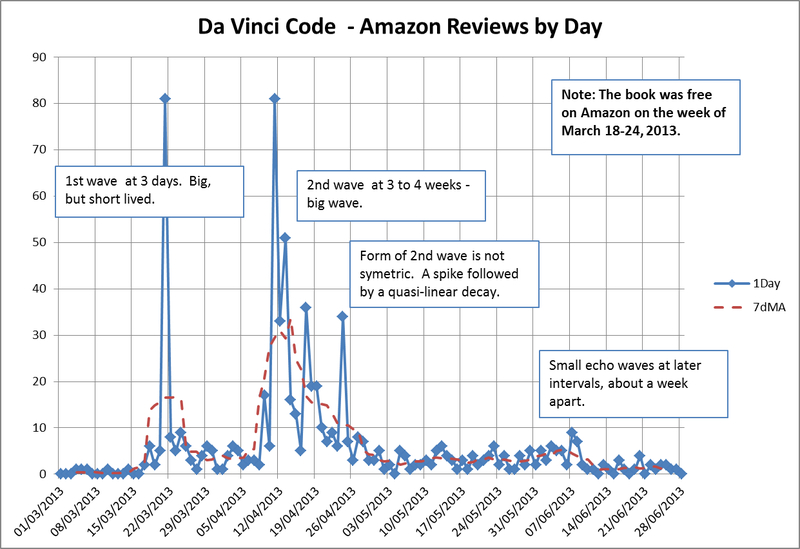 Anyway, there you have it; The Da Vinci Code has revealed another secret, this time about the lag time between obtaining and ebook and getting around to reading and reviewing it. How Evil Should Your Villain Be?